As Product Manager of a Warehouse Management System, it was amazing how many different ways every customer seemed to organize their picking processes! As varied as the business models, entity structures, and value propositions, the picking process helped define each company. When reflecting on it, the picking process defines how our customers see us. Did opening the package create a unique experience? Were items damaged? Were there serial numbers that had to be on the invoice? Was the invoice included, or does it arrive in email? Were the frozen items frozen upon arrival? When you work with a large team, these are all a factor, but none so much as time. Every day you should look at the pick path to find ways to optimize it: prevent errors, eliminate injury, and reduce hours. Below are the largest factors that you may have already dealt with from the warehouse floor to the C-Suite to ensure customer satisfaction upon delivery. Wave Picking or Order Picking? One of the first considerations is how the pickers receive their work. Early stage companies or medium-sized companies that have a few line items on each order might hand the order to the picker to pick straight from each order. If there is a picking system in place, the system may send pickers through the locations to grab each product in a pick path. Some of the most expensive mistakes are companies holding on to this method for too long. For busier warehouses, Wave Picking will allow them to make a single pass through a pick path for many orders at once. This can shave man hours in half while reducing the potential for damage. Systems that provide Wave Picking are more expensive, but they more than make up for it in the savings in efficiency for companies that can take advantage of it. A Pick Path is a route that a picker will take through the warehouse as they pick items. Warehouses are organized differently, but the most common is the snaking path. Like how many of us go through the grocery store, starting at one side, then going up and down each aisle. Skipping any aisle that does not have product on it for their order to save time. Another common mistake is numbering the bins from the front of the warehouse back. This makes it incrementally easier for putaway tasks, but exponentially more difficult for picking when time is most critical. It is good practice to organize for picking. It has only a slight impact on putaway, but saves time and errors when picking. Building Boxes or Building Pallets? Depending on your shipping methods, you could be building a case of a few items, full pallets that go on delivery with your own trucks, or anything between. Take a minute to look at the final product and how it stacks up, both figuratively and literally. Are the things on the top going to crush the things below? Is there a potential for leakage? Start with the end in mind and look at the shipments that are going out today. Would you want to receive them like this? Customers are a great source of influence here. Asking their opinion is great customer service. There are many steps to get the package out. Backtrack and change your Standard Operating Procedures to accommodate how the shipment needs to look. Your customers will thank you! So many warehouses are just big buildings that it is easy to forget that they can be broken up into more logical areas. Perhaps sister entities have their own areas. Special product types may need to be grouped together in another area. Working with a leading food distributor, we had over 6 discrete temperature areas. Does your product require environmental consideration? If you have frozen items, does a separate packing need to be done to add ice for those items? Would it make sense to have a small packing station in that area before the picker moves to another area? 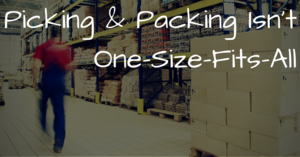 As your warehouse divides into many areas, keep in mind the pick path. What should be picked first, and how should the end result come out? While many warehouses can operate with just forklift operators, or just pickers because the racking is within reach, some need reserves. Pick locations are the human reachable locations where the product is stored. These are the locations that are considered a part of the Pick Path. Usually above the Pick Locations are Reserve Locations. Reserve Locations are where the excess inventory lives until the pick location is empty. Before picking starts, forklift operators will replenish the pick locations with inventory from the reserves. Usually, inventory is pulled in a First In First Out order. Pick locations should be large enough for a full day’s pick, but for faster moving items that isn’t possible. Those items will need to be replenished through the pick process as needed. Don’t let yourself fall into the trap of waiting for the picker to call for a replenishment. A Warehouse Management System should be able to make recommendations as a report to trigger a let down before it holds up your pick. Serials, Lots, and Weights Oh My! Lots and serial numbers are great ways to track product to ensure quality. In the pick process, it is critical to record that data at the right time. The manufacturer should have all the barcodes arranged in the sequence that pickers need to scan them. If not, it is possible to have them arranged in proper order. Remember, you are their customer. Labeling requirements are a common conversation. Weights are a little different. Weights need to be recorded on each item. They can be recorded at pick, or before shipping. The main consideration is that weights will need to be transmitted before invoicing to ensure the invoice reflects the proper pricing. How Do You Pick And Pack? How do you pick today? Did you see anything that improves your processes? Let us know in the comments below what your pain point is and you might see an article on that in the future.